Ask fellow campers about "Fla-Net Park" and nearby attractions. We stayed here for 2 nights in late March. The entrance our GPS brought us to was the back entrance and it had a gate that was permanently locked which blocked the road to the front entrance. On the exit they have spike strips to prevent people from driving the wrong way BUT these are located on a hill so make sure to not roll back. The roads were all gravel and were pretty beat up with large holes everywhere. Getting to our site was very tricky as they have 5th wheels sticking out to far from the site on both sides of the road which only gave us a couple of extra inches to squeeze by without scrapping one or the other. I would not stay here again. We camped at Fla-Net Park in a Travel Trailer. The campground is neither great nor terrible. It seems to have a large population of permanent residents, but most seem to maintain their campers and sites. There are a handful that look pretty trashy. Unleashed, uncollared, untagged dogs running loose. Lots of dog poop everywhere. The sites are mostly pretty tight, especially if you have slides on both sides. The neighbors awning is hanging over into my site a bit. Too tight to even bother putting out a chair and sitting out. Water pressure is good, power is steady. Didn't use the cable, so I cannot comment. Good signals on both Verizon and T-Mobile. Nice power box. Was able to put a lock on it to secure my surge suppressor. Road coming in is very, very rough, narrow, windy. Lots of pot holes. It did appear that there are preparations to repave and possibly widen a bit. It's safe enough if you drive slowly. I'm here a couple of nights for a work assignment. Not a place I would likely to return to for any other reason. We camped at Fla-Net Park in a Motorhome. Shopping center with Target, Walmart, and Lowe's (amongst others) is across the street out the back entrance. There are a couple of decent gas stations nearby that are big rig friendly. No cable and we were blocked by a tree so no Direct TV. Could only pick up a couple Korean channels on air antenna. Roads had washed some, but folks working a park were great. We had operator error problem with RV and owner and two of his guys helped us get going. They went above the call of duty to help us. I would recommend this park because of the owner and the folks working there. We camped at Fla-Net Park in a Motorhome. The park is very picturesque with a pond and a beautiful stream running through it. The showers and restrooms were clean, but they're a bit rustic and tired. It would be nice if the bathroom stalls were a bit larger. Some parts of the dirt road were badly eroded by recent rainfall, which left deep depressions that we had to maneuver around. Regardless of these issues, we would probably return to this park because of its beautiful location and its friendly staff. We camped at Fla-Net Park in a Travel Trailer. The park itself wasn't too bad, except the approach into the campground which is also the route out of it was horrible. You are on a very narrow road and when you leave you cannot see approaching traffic until it is too late. Be sure your water tank is full of fresh water because the campground's water has a very nasty taste even after going through 2 high grade water filters. I could never find the dumpster for garbage so I just took it out with me. There isn't much choice in the area but I would try to make other plans than staying here. We camped at Fla-Net Park in a Motorhome. This campground is occupied by permanent and seasonal residents who are workers (tradesman, contractors). It is one of the few (only?) campgrounds in the area that is open all year round with full hook ups. The campground was not well maintained, although during our last month there (May) the owners were upgrading, repairing roads (unpaved, bumpy, dusty, potholed), re-leveling sites and making the campground landscaping more appealing (requiring permanent residents to clean up their sites). Sites are pretty close, just enough room for the picnic table. There are no activities, just a small pool and a game room (that we did not use). Noisy in the morning and evening as people go and return from work. It is relatively close to transportation to NYC (NJ transit train stop nearby and 50 minutes to Newark Penn Station). Family owned. Everyone was friendly and helpful, a plus for us as this was our first campground in our new motorhome. Not a bad place to stay if you need to be near the city or the area and do not plan on spending a lot of time in the campground. We camped at Fla-Net Park in a Motorhome. This park is an excellent example of supply and demand. Only in RV-hostile NJ could a place this bad start in business. The folks who are running it are rude and arrogant. The owner has three huge dogs that are allowed to run loose. So then does every other dog. The sites are small and very close together. Some gravel, but mostly dirt, which means mud when it rains and dust when it doesn't The roads are horrible. Travel them at risk of suspension damage or worse. The workers are constantly playing with graders and dozers, but nobody fills in the manhole size potholes. We're visiting family nearby but next visit we'll park the rig in Pennsylvania & drive the car in. We camped at Fla-Net Park in a Motorhome. We had a pull thru site which was quite level. The sites are fairly close however no one was beside us on one side and the other side was in the next section over but at a higher elevation. We camped at Fla-Net Park in a Fifth Wheel. We were passing through NJ to go to a wedding in Virginia and stopped here to visit old friends in this area. Lots of restaurants and shopping quite close by. The staff were friendly, pleasant. Large area with terraced sites. There is a clubhouse with tv and games. A nice area by the small pond to relax in the shade. Two washers and two dryers in a covered but open area. Appears most of the campers are permanent residents. We stayed for one week. The park roads were narrow, curvy, and bumpy. Did not have any internet or television reception. We camped at Fla-Net Park in a Travel Trailer. Campground is convenient to interstates, highways. It is across the street from a large shopping center with a WalMart and other stores and fast food places. Also close to a Wild West Amusement Park. We got a train in Netcong that went to Penn Station in NYC. Also, Liberty Park in NJ for great view of NY skyline and statue of Liberty. Too far from where we were visiting family but it was the only one in the entire area. Showers were old and cramped and did not have any water pressure, so we only used them once. We discovered the water pressure was not good even in our trailer. RV site was really nice and clean. The picnic table was kinda in bad shape so we just didn't use it. Never saw any staff member around the park until the day we left and he was very nice and told us about the changes he was making in the park; made us look forward to coming back. We camped at Fla-Net Park in a Travel Trailer. Not much available in Jersey. We needed a convenient place to visit with family for the month. Poor reviews had me concerned. Monthly rate was reasonable at $740 but they have since increased it by $200. Cable is available on most sites but you have to make arrangements with Optimum and there is a $60 setup fee. It turned out our site did not have cable yet after being promised it did. There is no OTA tv. They are trying to upgrade the park but it is occupied by mostly working people. It is convenient to shopping, restaurants and hiways. This is not a destination park. There are cigarette butts and I had to tell my neighbor to pick up after his dog which tells you about the cliental. Because we couldn't get tv for a month we asked for a refund. The owner was gracious enough and refunded our money. We are now in a beautiful park in PA and my wife and I are very happy. I would not return. We camped at Fla-Net Park in a Motorhome. I stayed from September 2016 - February 2017. The park is quiet, convenient to the expressway and close to shopping and restaurants. The restrooms and showers facilities are dated - but kept clean and I liked it. All of the staff and the owner were friendly and helpful. We camped at Fla-Net Park in a Travel Trailer. Great park, easy access from interstate 80, just a few miles to train that will bring you to New York City. Owner is very helpful providing information on RV repair service and many other businesses in the area. Would stay again when we are in the area. We camped at Fla-Net Park in a Motorhome. Dirty, dirty, dirty! Roads are unpaved and in terrible shape. Bathrooms and community room are very dirty. WiFi spotty at best. Shady tenants. We camped at Fla-Net Park in a Motorhome. Walmart, Lowes, Bed Bath & Beyond plus major restaurants all nearby. Easier to come in and out off of International Drive, once you know where it is. Walmart and Lowes across International Road from the campground, with-in walking distance.. Nearby is the 1830's Morris Canal/Waterloo Village State Park, and the Delaware Water Gap. Walmart and a number of restaurants are just south of the park, and we could walk to dine. When we checked in, we were warned that a bear had been seen in the area. The wife and dog actually met the bear on a morning walk....so it DOES exist! Be careful out there...even in Northern New Jersey! Find somewhere else to camp. This is close to NYC, but not worth it. 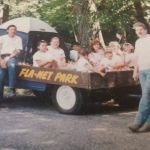 Are you affiliated with Fla-Net Park ?